They’re popping up everywhere: Hotels whose bread and butter is eye candy. Whether you’re a Gen Y Instagram Influencer with 100k followers, a teen who lives to live-story, or a dad holding up an iPad camera to capture the #familyvacation, when it comes to traveling in 2019, everyone wants that perfect shot. If you’re looking to #GramYourStay — and admit it, who isn’t — we’ve rounded up some of the most eye-catching, gram-worthy inns in New England. Grab your phone. <="" b="">The Hotel Salem is bewitching — eye-popping color in “Mad Men”-chic decor in the heart of downtown Salem. Each guest room is gram-worthy, bursting with color like a box of Crayola Bold markers. The on-site diner, Counter, feels like an old-school ’60s lunch counter. Give in to the urge to gram your scallops and pork belly with poached apple and shaved fennel. (#WinterComfortFood.) Then head downstairs to The Cellar for board games, TV, snacks, and brews. In warmer months, you’ll nab a stunning shot of downtown Salem from The Roof. #BirdsEyeView. 209 Essex St., Salem. 978-451-4950. www.thehotelsalem.com/@stayhotelsalem. <="" b="">This is one of two Lark Hotels in Witch City, along with the equally Instagrammable The Merchant (148 Washington St., Salem. 978-745-8100 www.themerchantsalem.com). 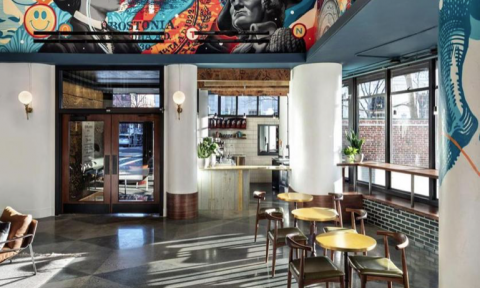 Lark Hotels — boutique hotels scattered mainly in New England — are all but built for Instagram. You can’t take a bad shot. With nearly 9,000 Instagram followers, @larkhotels encourages guests to post shots using the hashtag #onalark. Plus, there’s an Instagram Scavenger Hunt for each hotel. Complete the Instahunt to win prizes. Shots pop off the screen at Gilded in Newport, R.I. With ultra-saturated candy colors — hyper-intense blues, pinks, and purples — and a playful take on Gilded Age rococo, Apple TV, and curated small-plate breakfast, this isn’t your parents’ Newport. 23 Brinley St, Newport, R.I. 401-619-7758. www.gildedhotel.com @gildedhotel. #NoFilterNeeded at 250 Main, a luxe-modern boutique hotel in the former artists’ colony of Rockland, Maine. Rooms give off a simple, hip LA vibe — lots of reclaimed materials, hardwoods, clean whites and blues, glass walls and doors opening up to balconies with views of Rockland Harbor. It’s pet-friendly, so feel free to fill your feed with Fido. #DogsofInstagram. 250 Main St., Rockland, Maine. 207-594-5994. www.250mainhotel.com/@250mainhotel.